•	†These statements have not been evaluated by the Food and Drug Administration. This product is not intended to diagnose, treat, cure or prevent any disease. 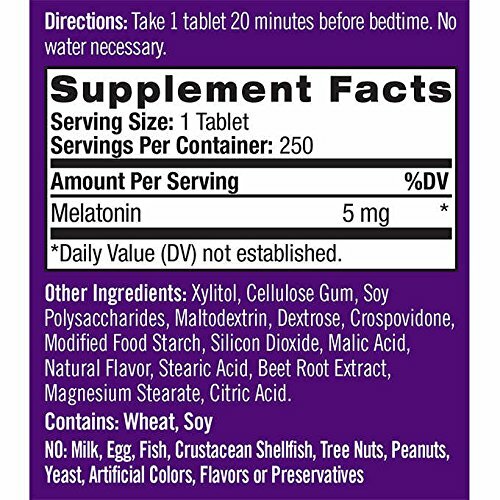 Directions: Take 1 tablet 20 minutes before bedtime. For best results, allow tablet to dissolve in mouth before swallowing. No water necessary. Supplement Facts Serving Size: 1 Tablet Amount Per Serving - % Daily Value Calories 0, Total Carbohydrate 0 g, Sugar 0 g, Melatonin 5 mg - *. *Daily Value not established. 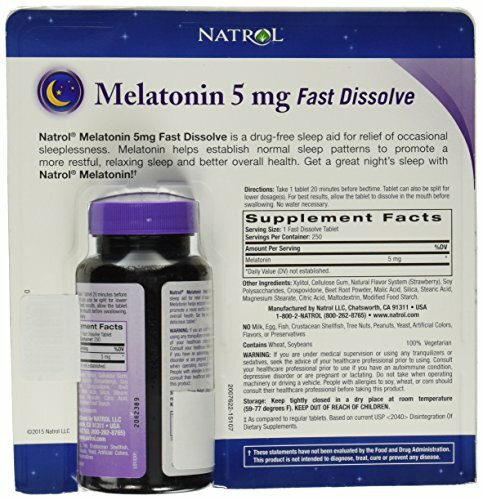 •	Natrol® Melatonin 5 mg Fast Dissolve is a drug-free, fast-acting sleep aid for relief of occasional sleeplessness. 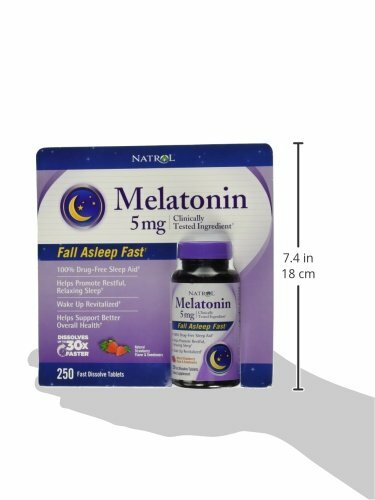 Melatonin helps establish normal sleep patterns to promote a more restful, relaxing sleep and better overall health. Melatonin has also been shown to help reduce anxiety. This delicious, strawberry flavored tablet dissolves quickly for fast results. 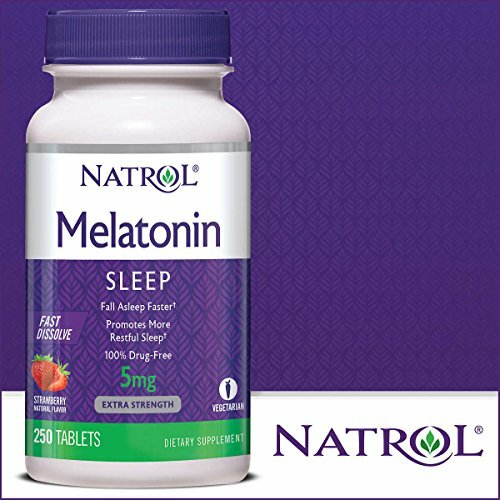 Relax and get a great night's sleep with Natrol® Melatonin!† Nighttime Sleep Aid Helps Reduce Anxiety Dissolves Quickly for Fast Results Drug-Free •	Other Ingredients: Dextrose, Cellulose, Cellulose Gum, Crospovidone, Strawberry Artificial Flavor, Beet Juice Color, Magnesium Stearate, Sucralose, Silica. No Yeast, Wheat, Milk, Egg, Soy, Glutens or Preservatives. 100% Vegetarian. Warning: If you are under medical supervision or using any tranquilizers or sedatives, seek the advice of your healthcare professional prior to using. Consult your physician before using if you have an autoimmune condition, depressive disorder or are pregnant or lactating. Not for use by children under 12 years of age. do not take when operating machinery or driving a vehicle. Store in a cool dry place. keep out of reach of children.